In our Cath Talk series is to provide you information on different types of catheters available in the market. If you have been using catheters for more than 5 years, you may have noticed the change in the kinds of catheters available to you. While this is exciting, it can also be confusing. With Cath Talk, our goal is to help you stay up to date with the industry news. Feel free to call us at 855-231-2100. 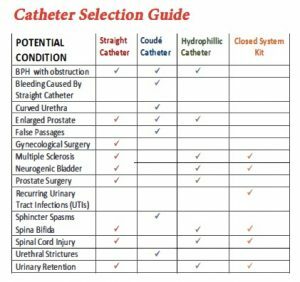 Choosing the right catheter depends on a wide range of elements such as your gender, weight, age, manual mobility, urethral sensitivity and visual impairement. In addition to that, it may also depend on how often you travel and how physically active you are. 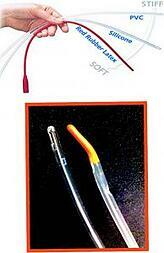 Catheters are made out of a wide range of materials. The most common materials are red rubber, latex, silicone, plastic and PVC. For those looking for a more rigid type, PVC material is the best choice. For those with latex allergy, red rubber is not a good option, but silicone is. Some catheters come already pre-lubricated. This might be a surgical lube (relatively stickier) or hydrophilic (water based). There are 2 kinds of tips: straight tips and coude tips. Straight catheters are tapered, so they can move smoothly through the urethra. Some urethras have blockages. Coude tips allow catheters to move past the blockages within the urethra. Some crude catheters come with guide stipes, which allow clearer visibility during insertion thanks to the bright color of the stripe. Coude tips may also vary: olive coude tip is slightly curved and tiemann tip has a more pronounced curve. Contact us at 800.000.0000 out more about catheter tips. Break the link between catheters and getting UTis in your head! Uriniary Tract Infections can be a pain, unless necessary precautions are taken to prevent it. Maintaining good body hygiene and using the right catheter can help you reduce or eliminate getting UTis. Did you know that, Closed System Catheters help reduce the chances of getting UTis? Closed system catheters (CSCs) are packaged as a sterile kit containing a collection bag, gloves, drape, and swab sticks. CSCs are designed to reduce contamination in the bladder. Most systems have an introducer tip that is inserted into the urethra first. This protects the catheter from bacteria that is found in the first 15 mm of the distal urethra, thus reducing the chances of getting UTis. CSCs are pre-lubricated which eliminates the need for additional packets. The attached collection bag allows for peace of mind while traveling, in case you cannot find a clean bathroom. Simply urinate into the system until bladder is empty, tear downwards at the perforation on the bag, pour the urine through the opening into the toilet and dispose of the bag properly. If you have had 2 or more UTIs in the last 6 months and have Medicare, you may qualify for a Closed System Catheter. Contact us to see if you qualify. Colopla st's SpeediCath Compact for Women, commonly referred to as the "lipstick catheter," is a discreet, easy to use, and pre-lubricated catheter designed for women on the go. Cure Twist is another catheter designed specifically for females and it is latex free. This sterile, single-use pre-lubricated catheter has a unique, attractive shape and size similar to cosmetic products. Coloplast's SpeediCath Compact Set is a simple design for everyday catherization available for both men and women. It's small enough to keep in a pocket or handbag, which makes the catheter one of the more popular on the market. 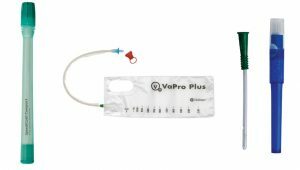 The hydrophilic catheter comes with an attached collection bag allowing an easy everyday use both in and out of home. A hydrophilic catheter is designed to be lubricated when moistened with water. Hydrophilic catheters have a special surface that binds water to create a lubricant that reduces the amount of irritation and abrasion when the catheter inserted into the urethra. This water-based lubricant allows for a smoother entry into the urethra with much less friction than conventional catheters, therefore causing less damage to urethra. Coloplast SpeediCath Compact Male, Hollister Touch-Free VaPro Plus Hydrophilic, and Cure Twist for Females.